Sugary snacks and drinks: Teens are more likely to rely on late night snacks, energy drinks and sodas to get them through the day. Unfortunately, these cause enamel erosion and pose a serious threat to their smile health. Encourage your teen to choose water whenever possible, and educate them on the importance of healthy snack choices. Poor brushing and flossing habits: As a parent, you are probably not flossing your teen’s teeth anymore. You may have even given up the fight to make sure they are doing it. However, not flossing and brushing on a daily basis is an open invitation for gum disease and decay. From bad breath to tooth loss, make sure they understand what is at stake if they don’t brush and floss properly. Skipped dental appointments: Routine dental cleanings are simply not optional. Now that your teen is driving and keeping his or her own schedule, don’t let them dismiss the importance of keeping up with their six month dental appointments. These visits are critical to address dental problems at their earliest, most treatable stages. Wearing braces: This represents one of the biggest challenges for teens. The adolescent years are a common time to undergo orthodontic treatment. However, braces require more diligent oral hygiene. While your teen’s smile may straighten, they can wind up with discolored teeth, white spots and infected gums without proper eating and cleaning habits while wearing braces. Sports: Does your child wear a mouthguard while on the playing field? Mouthguards should be considered a mandatory piece of equipment if your child is in a contact sport of any kind. A custom mouthguard can prevent tooth chips, avulsed teeth and other irreversible dental-related injuries. Preventing dental damage and treating signs of damage early is important. 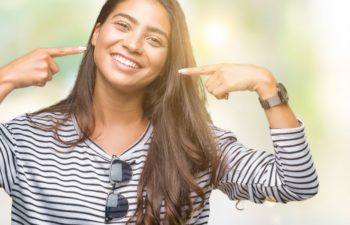 There are a number of restorative procedures that can be tailored to address your teens smile if necessary, including tooth-colored fillings to repair decay in a cosmetically pleasing manner, crowns to restore a badly damaged tooth, as well as Invisalign and traditional orthodontics to correct crooked teeth that are harder to keep clean. At Georgia Orthodontics & Children’s Dentistry, we welcome the opportunity to help teenagers achieve their healthiest and most confident smile possible.